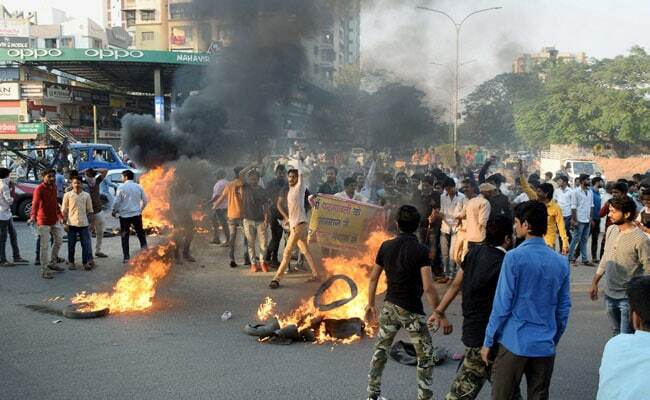 Violent Protests In Gujarat Against Padmaavat, Minister Says "Natural"
Senior state minister Bhupendrasinh Chudasama said such protests were "natural" and that the government was looking for a legal opinion following the Supreme Court's order. "Padmaavat", starring Deepika Padukone, Ranveer Singh and Shahid Kapoor will release on January 25. Ahmedabad: Violent protests by members of the Rajput community against the release of Sanjay Leela Bansali's controversial period drama "Padmaavat" were witnessed across Gujarat on Sunday, with agitators damaging buses and blocking roads. Senior state minister Bhupendrasinh Chudasama said such protests were "natural" and that the government was looking for a legal opinion following the Supreme Court's order. The Supreme Court on January 18 had paved the way for the film's nationwide release on January 25 by lifting the ban on its screening in BJP-ruled states Gujarat and Rajasthan. Following incidents of protesters damaging and setting buses on fire, the police issued a stern warning and deployed more personnel in the affected areas. The Gujarat State Road Transport Corporation also suspended its services in northern parts of the state. While lifting the ban, the court had stayed the orders and notifications issued by the Rajasthan and Gujarat governments prohibiting the screening of "Padmaavat", starring Deepika Padukone, Ranveer Singh and Shahid Kapoor. In northern parts of Gujarat, violent mobs set ablaze or damaged as many as eight buses in the past two days. Protests were held at some places in Gandhinagar, Kheda Banaskantha and Surat by members of the Rajput community, with agitating groups setting on fire a state bus on the Ahmedabad-Kheda highway this afternoon. Stones were also hurled at another bus at Unava village near Gandhinagar. Protesters blocked several roads such as the Ahmedabad-Indore Highway and a road connecting Banaskantha to Rajasthan, police officials said. In Surat, members of the Rajput Karni Sena and some other groups took to streets in the Katargam, Kapodra and Puna areas, police said. The state in-charge DGP Pramod Kumar announced deployment of the State Reserve Police (SRP) and the Rapid Action Force (RAF) to tackle the situation, as protests spread, particularly in Surat. "During the last 48 hours, some people in the garb of holding protests, have tried to disturb peace in the state by engaging in arson, damaging property and by blocking roads. As many as eight buses have been either set ablaze or damaged in north Gujarat during this period," Mr Kumar told reporters in Gandhinagar. "In view of the current situation, I have asked police officials to take a stern action against the perpetrators," he said, adding that several people have been arrested in connection with the protests. "We will not spare anyone who will break the law. Along with regular police, we have deployed SRP and RAF in affected areas," the top cop said. Meanwhile, terming the protests as "natural", Mr Chudasama said, "If a you distort historical facts and present it in a movie, it is quite natural that people will protest." "Though the Supreme Court had stayed our notification banning the release of the movie, the state government is taking legal opinion," he said. Surat police commissioner Satish Sharma said that police resorted to baton charge to disperse protesters. "Some protesters suddenly came on roads in different areas of the city today. As they tried to block roads, we were forced to do a baton charge. At two places, protesters even misbehaved with policemen. The situation is under control now. We have arrested 16 people," the police commissioner said. Due to protests, the state bus service suspended bus operations in Mehsana, Patan, Gandhinagar, Sabarkantha and Banaskantha districts till the situation improves, state road transport corporation , Secretary, KD Desai, said. Buses plying between Ahmedabad and the northern region have been cancelled since last night amid the fear of miscreants making these vehicles their soft target, the official said. "Owing to the attacks in parts of north Gujarat yesterday, we have temporarily suspended our operations for Gandhinagar, Himmatnagar, Mehsana and Banaskantha. The services to other destinations, such as those in central and south Gujarat, are on as per the schedule," he said. Mr Desai said that though they tried to resume the service in Gandhinagar this morning, some people targeted a bus at a village in the district. Following the bus service's decision, several passengers were stranded. Last night, agitators community allegedly set ablaze three buses in different parts of Mehsana. They also damaged the window panes of at least six buses in the region, according to the district police. The protesters had also tried to block roads by burning tyres in some parts of Banaskantha, Mehsana, Surendranagar and Bhuj in protest against the film. Karni Sena Declares Withdrawal Of Protest Against "Padmaavat"